When you are walking through a cemetery and you come across a monument and you don’t understand what it represents, look for clues. When I saw this monument, I noticed that the statue has wings. That is a sure sign you are looking at an angel. Often there are other signs that can lead you to a conclusion of what you are looking at, too. For instance, there are many types of angels, but not many of them wear armor and carry a sword. 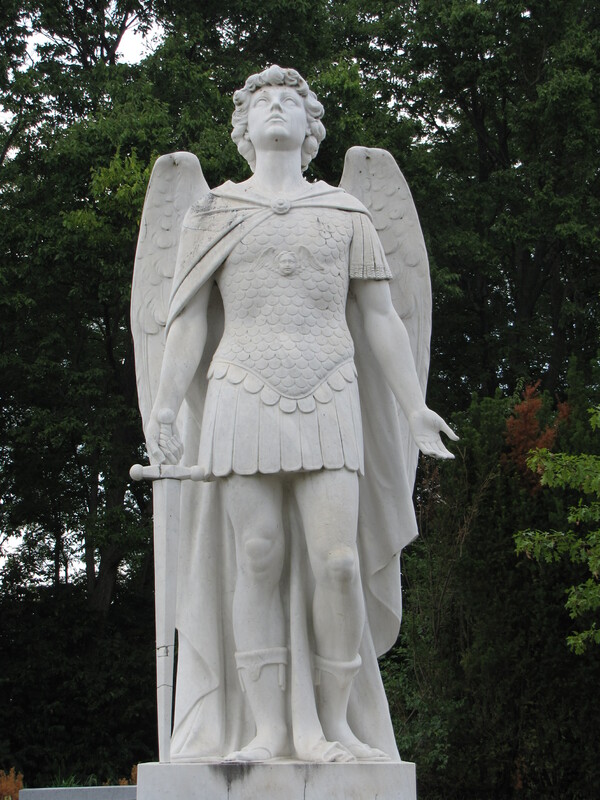 Only the Archangel Michael, one of three angels mentioned by name in the Bible, is clothed in armor. The sword He carries represents a cross but also a weapon in his war against the devil’s warriors. Archangel Michael is a Christian soldier fighting Satan’s hordes. Sometimes when you see the Archangel Michael, he is represented standing on dragon or a worm. Even though, that is not the case here, the fact that the angel is dressed as a soldier is a sure sign, this is Saint Michael. Sometimes if you look hard enough you can find other clues. This entry was posted in Angels, Saints. Bookmark the permalink. This reminded me of the Castel Sant’Angelo in Rome, which originally was the mausoleum of the Emperor Hadrian, who died in 138. Of course, the angel was not there at that period. It was added later when the mausoleum was converted into a fortress in the 14th century. 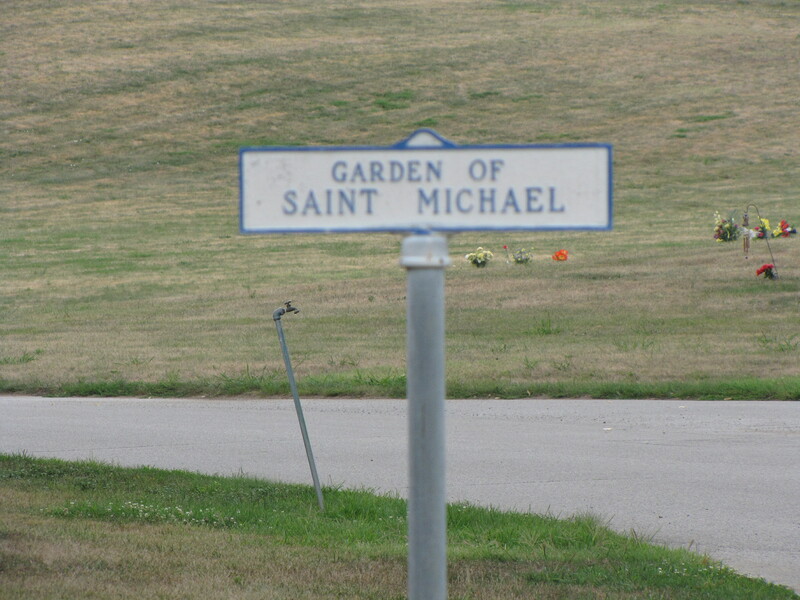 Why St. Michael? Legend has it that the angel appeared over the mausoleum in 590, sheathing his sword as a sign that the plague had ended. Thus the edifice acquired its name and later its crowning statue. 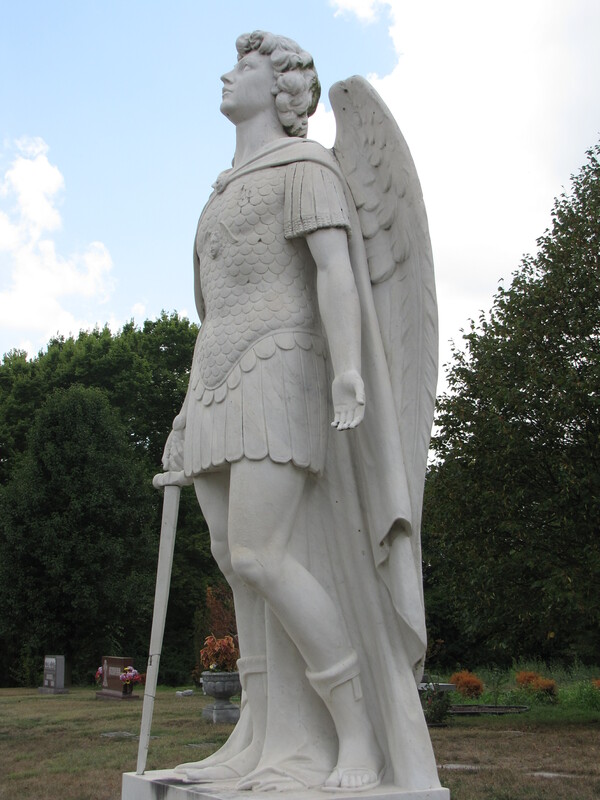 The current bronze statue of St. Michael is a later one by Peter Anton von Verschaffelt, dating from 1753. It replaced the original marble statue by Raffaello da Montelupo, which was created in 1536. The original angel can still be seen in the Castel Sant’Angelo, which is now a museum. This is a beautiful testament to angels watching over us, even in death. So comforting.